But I don't like pink? Pink the colour, not so much my fave. I barely ever wear it. So in honour of our upcoming trip to see our favourite rockstar, P!NK in concert dans la belle province, I have actually photographed some fashiony pictures and turned them in to a style post. Spring must be in the air! At a ringette tournament in Regina back in February, I got these pink Hunters practically for free at DSW. They were like 10374482% off. I had to buy them. Plus they are the first Hunters that fit my strong calves and don't look weird and bendy. Must be because they're mid-calf and awesomely pink. 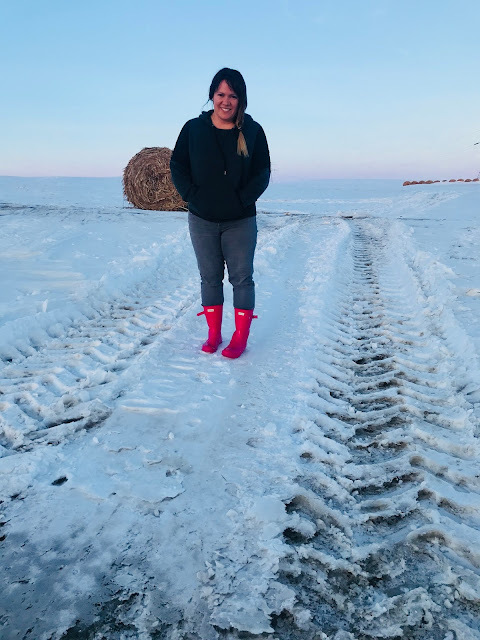 It has finally been melting here and even with the random snow storm we had, the boots have been perfect for mucky and wet acreage life. As you can tell I'm still mostly wearing blacks and greys, so it's not complete spring wardrobe takeover yet. But my spring wardrobe swap out from the archives is scheduled for next weekend! Yay for colour! Linking up with my bloggity friends on the Blended Blog. You wear those pink Hunters very well and it sounds like DSW pracically paid you to get them, lol! First, I always love your non-fashion fashion posts. lol Second, I just started my closet flip over yesterday. As I was packing for vacation I had to bring out the spring stuff. Another FYI, your birthday always served as the beginning of my spring to me in our childhood, sooo we are almost there. Yay, love these. I've never owned a pair of Hunters because I think they're overpriced for rubber - guess I need to be spending more time at DSW. Are they warm? Or do you have a liner in them? Pink pop is perfect, the boots and the bad-A singer! FUN & CUTE! Maybe I need to try the mid-calf ones. Because the tall ones definitely don't fit over my calves! Strong calves...I like your wording! I love the pop of pink. Good buy! I love your pink Hunter boots ! And, what a steal for 10374482% off! I don't hate pink but I don't love it either. Those boots and graphic top are fun Deena and they both are perfect to spruce up an outfit for a cold and snowy Winter day. It snowed this morning here, too.